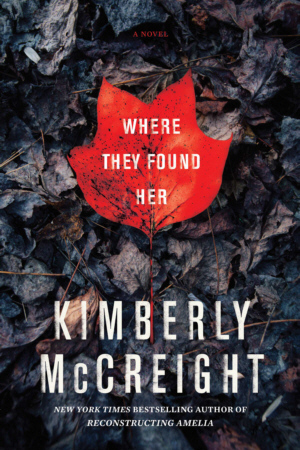 WHERE THEY FOUND HER, a riveting domestic thriller by New York Times bestselling author Kimberly McCreight, offers a searing portrait of motherhood, marriage, class distinctions and the damage wrought by betrayal, forcing us to consider how well we can ever really know even those closest to us. Motherhood hasn’t come easy for Molly Anderson. But despite her initial reservations, it turns out that leaving her beloved New York City for the bucolic, yet sophisticated suburb of Ridgedale, New Jersey may be the best thing that could have happened to her. Six months after their move—so that her charismatic and attentive husband Justin can take a tenure track position at the prestigious University—Molly is shedding the remnants of the severe depression that has dogged her since a traumatic stillbirth two years earlier. She’s finally enjoying life as mother to 5-year-old Ella and as Arts reporter for the small, but respectable Ridgedale Reader. That is, until the tiny, battered body of a newborn is found in the woods adjacent to Ridgedale University’s ivy-covered campus, a campus that may already have much to hide. Molly is unexpectedly called upon to cover the story—the biggest one to hit Ridgedale in years—and one that threatens to unearth crimes both current and long past. These secrets threaten even the town’s most powerful residents, like Barbara, wife of the handsome Police Chief, whose picture-perfect life has suddenly begun to unravel as her young son inexplicably starts faltering. And Stella—Molly’s new mom friend—a brash, bluntly honest ex-banker and divorcee who’s a breath of fresh air, but who, even Molly must acknowledge, is also wildly unpredictable. There’s another Ridgedale, too, the one the rest of town would rather forget. There’s the low-income Ridgedale Commons, the apartment complex inhabited by the people who do Ridgedale’s cooking and cleaning and fixing, including sixteen-year-old high school drop-out Sandy Mendelson who spends much of her time trying to keep her wayward mother Jenna on the straight and narrow. Despite her tough-girl exterior, Sandy longs for a way out and isn’t afraid to work hard for it. But when her mother Jenna goes missing, she may learn that pulling herself up by her bootstraps has been doomed from the very start. Told from the perspectives of Molly, Barbara and Sandy, WHERE THEY FOUND HER unwinds the tangled truth about what really happened to the baby, revealing that these three women are far more deeply connected than they ever realized. And that the very worst crimes are those we commit against the ones we love. See the trailer for Where They Found Her here.